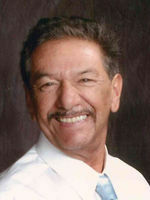 Henry P. Gonzales, surrounded by loved ones, he answered his heavenly Father when he called him home on the morning of February 27, 2019, in Las Cruces, NM at the age of 79. Henry’s passion, as anyone that knew him knows he loved playing his guitar and singing! Many weekend gatherings were held at his home where family and many friends would come to hear him sing and play. His daily favorite pastime was walking his two beloved dogs Coco and Cookie. Henry was also a devout Catholic at Immaculate Heart of Mary where he also served as an Usher. Henry is survived by his two sons, Henry James Gonzales, Reggie Gonzales and wife Cathy and a daughter, Sharon Hosfeld and husband Michael. Other two survivors include two grandchildren Jude A. and Hope Sienna Gonzales and an older brother Gustavo Gonzales plus a very large extended family and friends. He was preceded in death by his wife Esther B. Gonzales, his parents: Andres and Estefana Gonzales; two brothers Samuel and Reymundo Gonzales and a sister, Dora Cordova. At Mr. Gonzales’ request, a Celebration of Life Service will be held on Saturday, March 16th, at 11 AM at Getz Funeral Home Chapel, 1410 E. Bowman Avenue with family member Chaplain Daniel Castillo officiating. Henry’s wish was to be cremated and spread together with his wife’s ashes, this will take place at a later date. Henry lived his life with kindness, compassion and generosity, never asking for help but always willing to helping out. Nobody was a stranger to him, and he will be greatly missed by those who loved and knew him. The family would like to express their sincere gratitude to all the people that touched Henry’s life. To send flowers to the family of Henry Pena Gonzales, please visit our Heartfelt Sympathies Store.